Ski turing - Ski Mountaineering with GO!Ski Zakpane! related to winter tourism, ski trekking and downhill skiing. Thanks to special ski equipment customized for mountain hikes and the help of our guide, who leads the group, you can wander along the most beautiful Tatra trails in the winter, visiting the most famous valleys and climbing the passes and peaks of the Tatra Mountains. This offer is directed to people who are able to ski on their own and want to expand their horizons in new disciplines of skiing. The selection of the hiking routeitailored to the skill level and physical condition of the group, current weather conditions and preferences of our customers. Our packages include tours of varying difficulties; for beginners, we recommend a walk through the Tatra valleys, while we invite our advanced athletes to take on the Tatras’ more demanding passes, cumulating in an intense downhill ride. Have a special design, are soft-fitted and very light. Their weight is much less than the weight of standard downhill skis and starts at about 600 g.
Have a special structure and regulation. When putting on the skis, you set the bindings so that you can release the heel to allow freedom of movement. When getting ready to go downhill, you lock the back of the bindings, which keeps the entire boot stable (the heel does not rise), which gives you a smooth ride down, like in downhill skiing. Like with the rest of the equipment, they are very light. Their advantage is the ability to adjust within the ankle joint to ensure your comfort during the approach and maximum stability during descent. A necessary piece of equipment that allows you to go uphill. 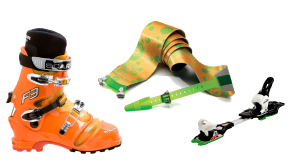 They are made of synthetic material, and are mounted on the skis using special hooks and adhesive. Thanks to their special properties, the skins prevent the skis from slipping backwards, even during a very steep approach. The set consists of three components: a detector, probe and shovel. To ensure safety during the trip, this is standard and mandatory equipment for each participant.